Northern Lights starring Piolo Pascual. 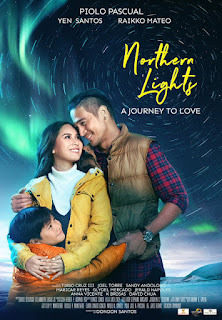 Northern Lights: A Journey To Love is a Filipino romantic drama film starring Piolo Pascual, Yen Santos, and Raikko Mateo. Directed by Dondon Santos, Northern Lights tells the tale of two people looking for something and someone in their lives. The glue that connected them together is a young child whose mother is on the brink of dying. Formerly titled Once In A Lifetime, Northern Lights was shot in Queenstown which is a resort town along the coast of New Zealand's South Island. New Zealand was used as a substitute for Alaska which is among the main settings in the film. The movie took its name from the famous northern lights in Alaska. This is a natural phenomenon more popularly known as the Aurora Borealis. It can be observed in North America and parts of Europe. Northern Lights is a collaboration project by Star Cinema, Regal Films, and Spring Films which is Pascual's own film production company. In the movie, Piolo plays an OFW in Alaska named Charlie. When he moved to Alaska with his parents, Charlie left behind in the Philippines his already pregnant girlfriend. He promised to come back for her but when he did, he found out that his girlfriend met another man. Dejected, he went back to Alaska and lived a promiscuous life. Things changed when Charlie learned that his former girlfriend is dying and that she's sending their son (Charlie Jr.) to Alaska to live with him. Charlie Jr. met another passenger on the plane named Angel (played by Yen Santos) who served as her travelling partner and guardian for the trip. The three characters convene in Alaska and embark on a journey that will change the course of their lives forever. Also starring in Northern Lights: A Journey To Love are Tirso Cruz III, Joel Torre, Sandy Andolong, Maricar Reyes, Glydel Mercado, Jerald Napoles, Anna Vicente, K Brosas, and David Chua. The movie will be released in theaters on March 29. Prior to appearing in Northern Lights, Pascual starred in last year's Love Me Tomorrow and A Lullaby To The Sorrowful Mystery.